W0752: Structure N10-9 – Jaguar Temple Structure N10-9 at Lamanai is known as the Jaguar Temple because of the two jaguar masks on its base. Dating from the Classic Period, between 500AD and 600AD, the Jaguar Temple is located at the southern extent of Lamanai’s ceremonial strip of buildings and is one of the last major pyramidal structures to be added. It was built in the style that the High Temple‘s second phase also exhibits, with a single wide stairway and a large terrace on the first tier for the temple. 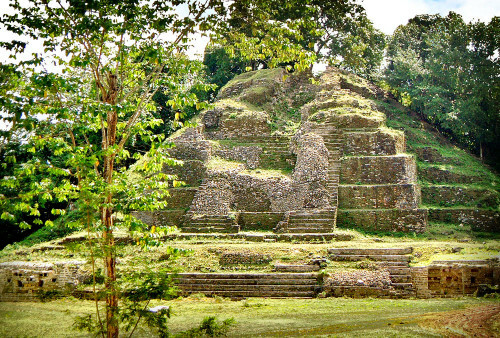 Major construction work was undertaken on the Jaguar Temple during the 8th century which drastically changed the front of the structure. Up until this point the temple was based on the bottom terrace just above the masks (which are at the lowest level in fig. W0752 on the left and right edges of the photo) and the rest of the building was purely symbolic of the sacred mountain. During the 8th century an extra pyramidal structure with rounded corners to the front of the existing pyramidal base (which you can see clearly in fig. W0752 to the right of the main stairway leading up front the first terrace). This additional frontage served the purpose of creating a second terrace three-quarters of the way up the base on which they built a second temple ( in fig. W0752 the remnants of the doorway to the temple are just about visible as a vertical wall where the stairs end three quarters of the way up). The major work carried out between the 12th and 13th century did little to change the functionality of the temple and may have been undertaken solely to repair the structure after a period of disrepair. 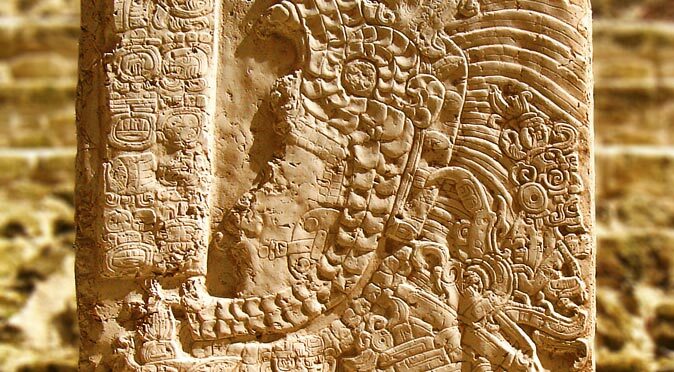 Very few cities survived the Classic Maya Collapse which occurred in the 9th and 10th centuries, so Lamanai may have been semi-abandoned for a short period and requiring some significant maintenance. 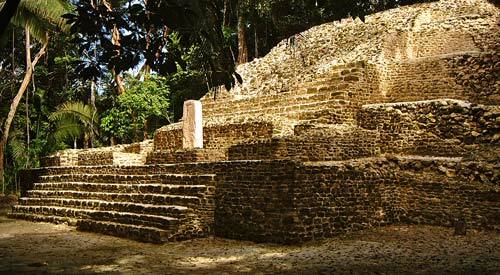 Additional niches were still being added at the foot of the stairs during the 15th century, which suggests that this Temple was continuously used until Lamanai was Christianised by the Spanish. W0755: Jaguar Mask Like the masks on the Mask Temple and High Temple at Lamanai, the Jaguar masks on Stucture N10-9 are made from carved stone rather than moulded stucco plaster. The builders cleverly chose to create a stylised image that could be created quite simplistically by arranging bricks – saving the effort of carving out the jaguar’s various features and then slotting them together. 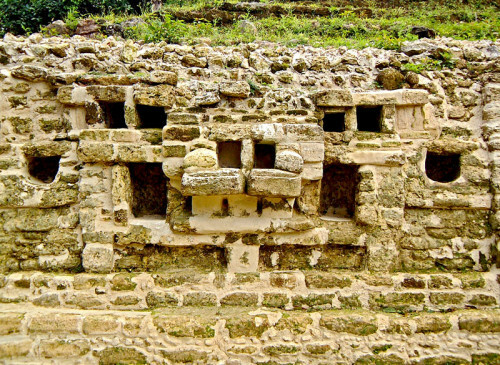 The design was also a very elegant solution, because the spaces that were created to define the eyes, nostrils, cheeks and ears, made perfect niches for leaving offerings to the Jaguar God. 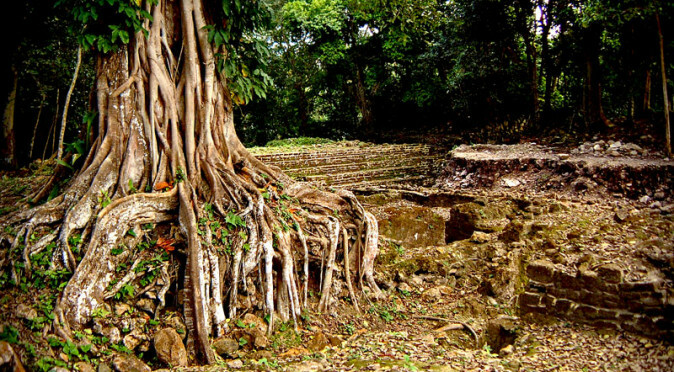 Lamanai was occupied for over 3000 years, and although it needs a great deal of work and investigation still, it is certainly a magnificent sight and a place well worth visiting. 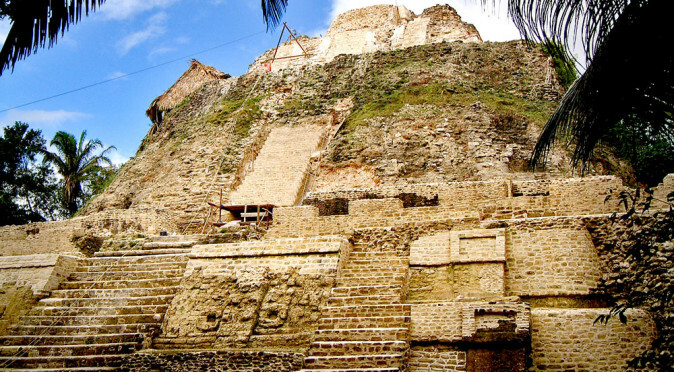 Although possibly not as old as the Mask Temple, the High Temple was built in c.100BC and was the tallest structure in Mesoamerica upon completion. 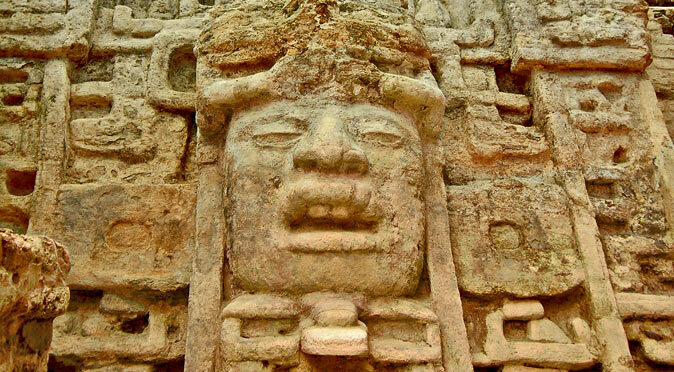 Stela 9 was found amongst the ruins of Structure N10-27 and is one of the few monuments found at Lamanai that can provide a glimpse into its lengthy history.